making: ROBYN'S FETISH CHALLENGE # 220 "CHRISTMAS IN JULY"
ROBYN'S FETISH CHALLENGE # 220 "CHRISTMAS IN JULY"
Good Morning!!! Hope everyone is having a good day so far. I'm having a slow start but as soon as I drink my pot of coffee I will be up and moving. I'm going to try and enjoy my day because my daughter's soccer practices and games is wearing me down. Practices start at 8:00 am. They are for two hours but I stay up there to save gas. Plus by time I would get home I would have to turn around and go back. So this is the easiest way to do this. This week we have practices and dentist appointments and other activities. I thought we were on summer break. My boys was never interested in sports so this all new to me. With her starting high school they do things differently and they practice way more then before. This is a fantastic prize to win. If I have the time I would like to make something and enter. But, with my schedule I will have to see. Now I would like you to see the card that I made. I tried to use vintage colors with a little vintage looking flowers. I had this great set of 3-D stickers and this one fit perfectly with the card. I tried to go by a sketch but this is no where near it. I don't know how I went from a sketch to my own design. 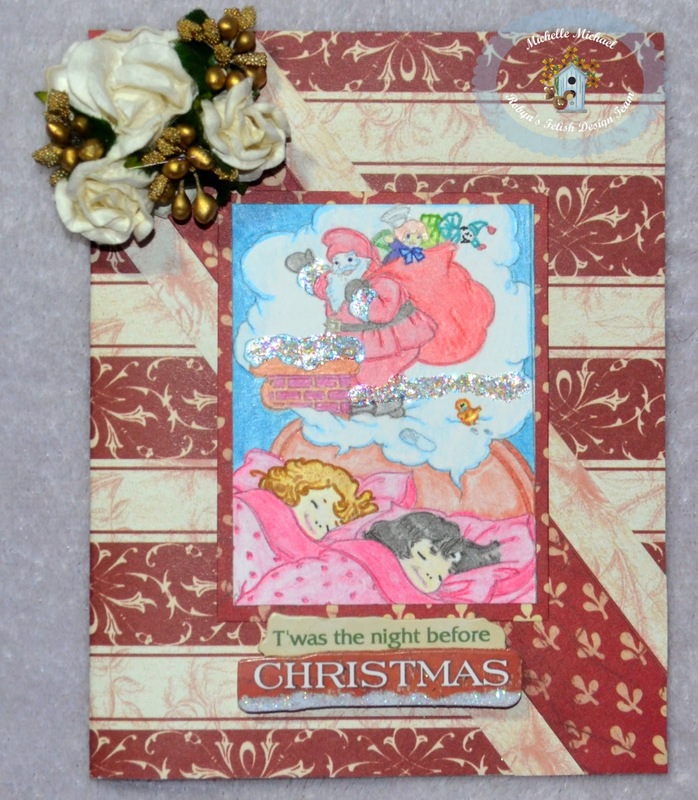 Well, let me tell you what I used to make this vintage card. I'm so glad that you stopped and seen the card I made to share with you for our challenge. I'm sure you all know but just go to Robyn's Fetish Challenge Blog and enter your card. I can't wait to see your creations. Hope you have a Wonderful Week and I will be back next Sunday. Lovely card. Love the glitter round Christmas Father and that lovely vintage look.